For what is probably the world’s most famous and popular steam engine, the Flying Scotsman has experienced a remarkably troubled history at times. But underlining its enduring appeal, an original nameplate for this ex-LNER Class A1 (later A3) 4-6-2 locomotive has sold at auction sold for a hammer price of £64,500 (plus 12% buyer’s premium) to an online bidder on thesaleroom.com – a record for a nameplate. It was offered at Worcestershire specialist saleroom GW Railwayana Auctions on November 17, estimated at £30,000-35,000. The auction included more than 500 attendees, along with a lot of bidders on the phone, internet and in the room. The previous record was the £60,000 paid for a Golden Fleece nameplate in 2004, also an LNER locomotive (an A4), which was offered at Sheffield Railwayana Auctions (now incorporated into the Grand Central Railwayana firm). 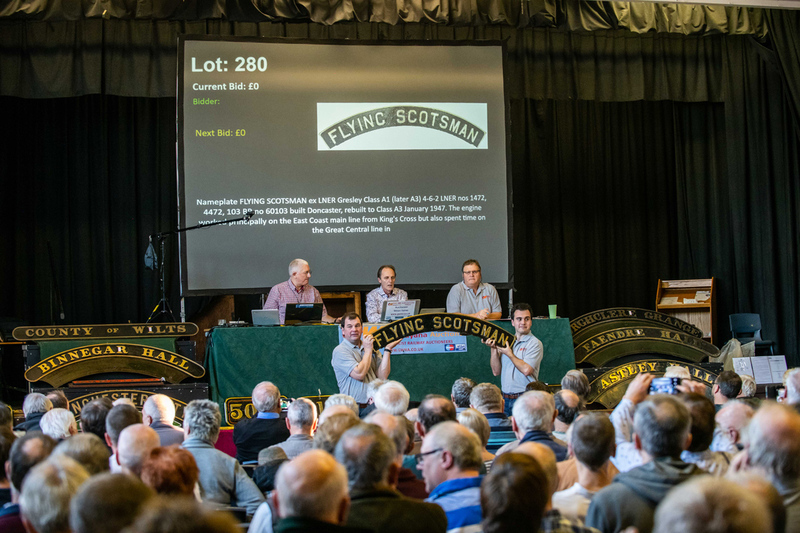 The 1.47m (4ft 10in) long Flying Scotsman plate was consigned by the family of a collector. But why wasn’t it actually still on the locomotive itself? Flying Scotsman was built in Doncaster 1923 to a Nigel Gresley design for the London and North Eastern railway (rebuilt to Class A3 January 1947). It was something of a flagship locomotive from the start, being used often for publicity purposes (having been named in February 1924 with the number 4472). The engine worked principally on the East Coast main line from King's Cross but also spent time on the Great Central line in the 1950s. On November 30, 1934, it became the first steam locomotive authenticated at a speed of over 100mph. Flying Scotsman’s final journey was on the 1.15pm from King's Cross on 14th January 14, 1963, after which it went straight into preservation owned by Alan Pegler, who had been on the footplate for that final journey. It was restored at Doncaster Works to its original condition with a single chimney and no smoke deflectors. It was back on the main line in late March 1963 and by 1966 Flying Scotsman was running with a second (water cart) tender and had been through a general overhaul at Darlington. From 1968 it was the only steam locomotive allowed to run on British Railways thanks to a contract arranged by Pegler. In 1969, after having been fitted with various accoutrements to allow running in the US, the engine left England for the US and Canada. However, by late 1972 Pegler was in serious financial difficulties and the locomotive was acquired by the late Sir William McAlpine, who secured its repatriation and overhaul. From 1988-89 Flying Scotsman toured across much of Australia and, by 1993, it had been overhauled again and put back into its late BR condition with a double chimney and German style smoke deflectors. For a brief period in the 1990s the loco had joint owners, Sir William and Pete Waterman, before its sale in 1996 to the late Dr Tony Marchington. Following (another) bankruptcy, in 2003 both original nameplates and workplates were sold into the railwayana world and the loco was fitted with reproductions which it has carried since. 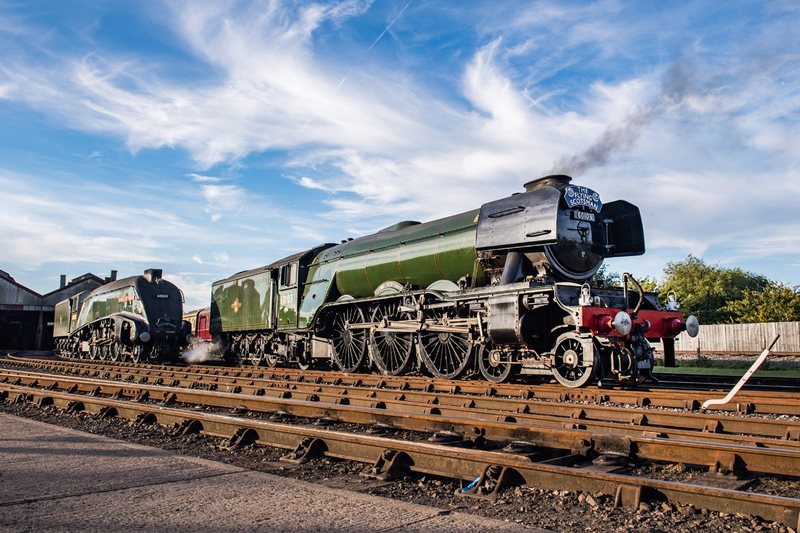 By 2004 Flying Scotsman was being auctioned off and could have gone abroad, but the National Railway Museum in York, aided by public and private donations, bought it for £2.3m. To cut a (very long) story short, after an extensive restoration programme the engine is finally back on the rails and indeed running charter trains. 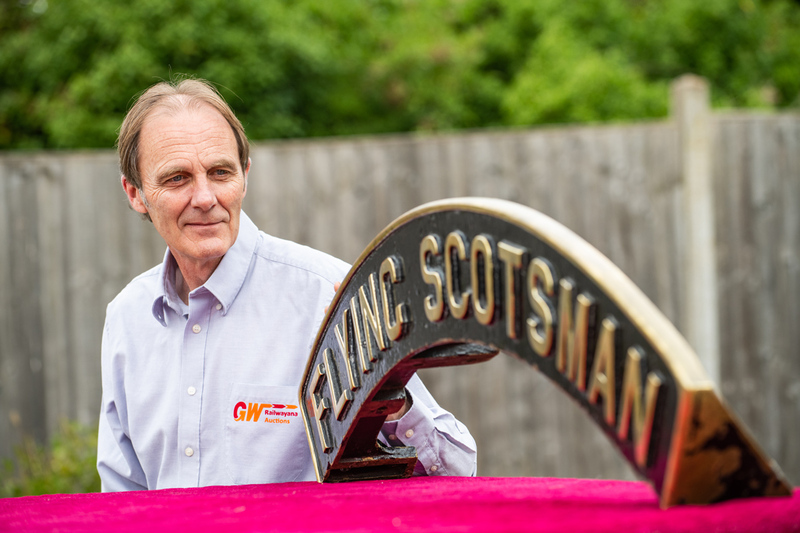 GW Railwayana director and auctioneer, Simon Turner, with the Flying Scotsman nameplate sold for a record £64,500 (Photo: JB Media/Jack Boskett). The original A1 (later A3) short nameplates were prone to cracking and Doncaster issued a new design in 1926 with strengthened webs and bosses and this is one of those. The plate sold for £64,500 was on the right-hand side of the loco and numbered 103, its 1946 LNER number which is chiselled into the bottom of one of the mounting webs. It was the first time either nameplate has been on public sale.